My family was excited to be able to review a Cooks Ham this holiday season! We got the Brown Sugar Spiral and it was very yummy! Great for dinner and also makes wonderful sandwiches! I love the variety Cooks Ham has to offer. There are many brands of ham available, but to ensure consistent quality and a great tasting ham, look for the Cook's name. That’s because Cook's hams always begin with old-fashioned bone-in hams for a more natural texture and taste. They slow-cure their hams with natural ingredients like pure cane sugar, real honey, brown sugar and maple syrup. For the perfect finish, they smoke their hams for hours using real hickory wood. This process gives their hams a taste that separates Cook's hams from the rest. 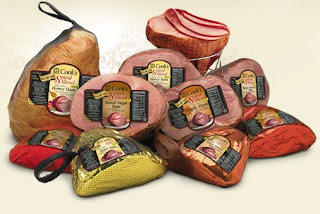 Since their introduction by Cook Family Foods in 1983, Cook's branded hams and other smoked meats have been packaged and sold to leading supermarket chains and independent grocers throughout the United States, Canada, Mexico and Puerto Rico. In fact, Cook’s is the nation's leading brand of traditional and spiral sliced smoked bone-in ham, corned beef and smoked picnics. Cook's branded products are manufactured using raw materials purchased only from meat packers who meet the company's strict quality standards. An unwavering commitment to strict quality standards, product consistency and manufacturing efficiencies are trademarks of the Cook's brand and are evident throughout the company's manufacturing and service operations. As a result, the Cook's brand is top quality, competitively priced and, in many regions, dominates the supermarket meat showcase. The company also has earned an industry reputation as an innovative leader in product development, display-ready packaging and quality control. Our focus on smoked ham and our dedication to a consistent, high-level of product quality, superior service and sensitivity to customer needs have always been the foundation of the Cook's brand. one lucky reader a coupon for a free ham! Perfect to serve and celebrate the new year 2010! Cooks ham is so good! I really like a good ham. I'd love to win this - Cook's Ham is fantastic! 1. Love to try a good ham. I think I could REALLY enjoy some ham right now! I voted for you! Is it OK to vote every day or is it only 1 vote per person? I love ham for New Year's Day dinner. Wish you were here to share one with us! Yummmy - I love Cooks ham and would love to win. We love us a good ham! Yum! This would make an awesome dinner! I have been meaning to try one of these spiral hams so now you've got me going (drool) so if I don't win it I will get one in January anyway. Thanks for the chance. I gave you a vote at Top Baby! Ham is something my husband just loves. I like it too. I'm glad I do too! My daughter loves ham! She actually doesn't like Turkey so I have to make both ham and turkey for Thanksgiving. Ham is so yummy for any occasion! And have your adorable button! I love this kind of ham! Love Cook's ham, great for holiday meals! I voted by clicking the button. Yum! Sounds wonderful! Happy New Year! 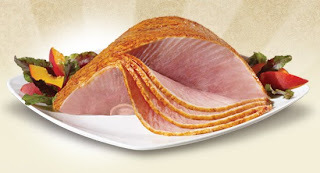 I love Cook's Hams--the same one you had--honey spiral sliced. This ham looks great! Thanks for the giveaway! The best ham we ever had was a Cook's ham! Would love to win a free spiral sliced one! I love spiral sliced ham!